Nightlife? There's an App for That! [prMac.com] Mumbai, Maharashtra - We have all been in that familiar situation where we feel like going out on the spur of the moment and we just can't seem to figure out what's good around us, how expensive the options are, what's the crowd going to be like and more importantly what's happening at the venues we have just Googled. To simply find out what's new in the music and nightlife scene is a herculean task in itself. Facebook is so full of clutter that it's a task to filter out events from everything else. There is just so much disengagement and how many people actually turn up to events that they RSVPed to last week? In fact one has to navigate through a plethora of apps and websites to get all their music and event information. One looks to Facebook and Google for events, Zomato for menus, BookMyShow and Insider for ticketing, all those music apps to listen to artists, playlists and DJ sets. It's all too much. Mumbai-based startup Flipsyde aims to simplify this process. A clutter-free social discovery app that was conceptualized on the basic need of 'Whats-happening-where-and-at-what-time' aims to provide a simple solution to all this by simply following the one app to rule them all approach. 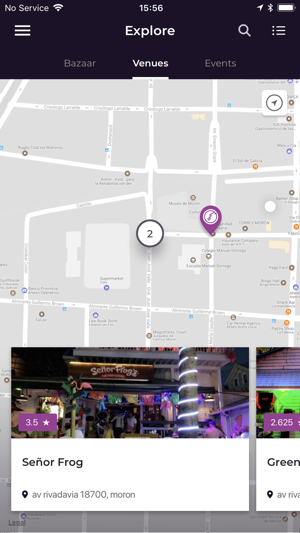 Designed and developed collaboratively in India, The United States and Argentina, Flipsyde gives you a list of bars, pubs, nightclubs and live performance venues based on your interest and geo-location. You have the ability to keep track of events via a minimalistic calendar, listen to music by artists who may be performing somewhere on a particular evening and figure out if it's something you'd want to attend and even purchasing tickets via different platforms, all without leaving the app. Currently in Beta, the app features close to a hundred venues in Mumbai, 200 in the States - in Miami, New York and LA and 50 in London and continues to grow every day. In the next three months Flipsyde aims to list bars in all the major cities in the world. What makes Flipsyde interesting is the ability for venues and artists to control their own backends via a simple online interface. It's almost like updating a blog and voila, hit submit and your details, pictures, events, menus and songs are published immediately to the app. Prices have changed? Not a problem, simply upload your new menus to the app. Released a new song? Simply upload it for your followers. Hosting an event day after? Publish it immediate and reach relevant audiences ASAP. Flipsyde aims at not only building a subscriber base of people living in a particular city but also will eventually help tourism industries around the world. With Flipsyde installed on your phone it's going to be as simple as landing in a new city and knowing exactly what is happening near you based on your location, pre-defined interests and your budget. After installing Flipsyde, if you are into say, Karaoke, you don't have to walk around London, LA or Mumbai looking for that karaoke bar. You don't have to Google it and take shots in the dark. Upcoming features will tell give you a comparison to karaoke bars in your own city that you have enjoyed going to and will recommend karaoke bars in the new city you're traveling to based on your specific preferences, if that's what you prefer. The Flipsyde app is a beautiful and simple app with a familiar social networking interface that anyone will pick up in minutes. In fact the design and interface has been recognized universally for it's tremendous potential in changing the way we go out. In October 2018, Flypsyde's founders were among a handful of Indian mobile technologists who were invited by Apple for an app review and further assistance by Apple. Flipsyde 1.6 is available for download on Google's Playstore and Apple's App Store. For more information visit the Flipsyde website. Flipsyde 1.6 is free and is available worldwide through the App Store in the Entertainment category. An Android version is available through the Google Play Store. FlipSyde a beautiful social networking platform (Android, iOS and Web) that helps people find bars, pubs, performance venues, artists (music and nightlife related) etc on a mapFlipSyde is a beautiful social networking platform (Android, iOS and Web) that helps people find bars, pubs, performance venues, artists (music and nightlife related) etc on a map. All Material and Software (C) Copyright 2019 FlipSyde. All Rights Reserved. Apple, the Apple logo, iPhone, iPod and iPad are registered trademarks of Apple Inc. in the U.S. and/or other countries. Other trademarks and registered trademarks may be the property of their respective owners.